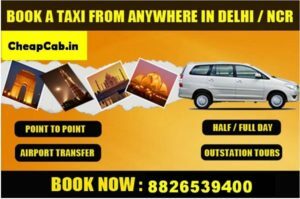 All posts tagged: "hire a taxi in delhi"
Home Posts Tagged "hire a taxi in delhi"
Want to enjoy your full day exploring the city…! Well, hire a full day taxi in Delhi. The capital has been the witness of its glorious past. It has always been a place for historical and commercial significance. Great monuments and architects depicts the glorious past of Delhi. Monuments like: Qutub Minar, Red Fort, Rashtrapati Bhavan, India Gate, Golden Temple, Parliament House depict the story of past. Delhi has also become the major stop for shoppers via Sarojini Nagar, Connaught Place, Karol Bagh. Taxi hire in Delhi via cheap cab gives you the long-lasting and beautiful experience to visit this place. We have made available at very reasonable prices. At Cheap cab, we ensure that you have the best time to enjoy your journey. Delhi has been the long list of tourist spots, historical places and shopping complexes. Visiting such places can be a bit difficult traveling via any mode of transportation. But when you hire a car then enjoying your day becomes more comfortable as chauffeur takes all the headache of getting the car parked, while you enjoy the city. Cheapcab.com is a very user-friendly platform to book cheapest cabs in Delhi online. We also ensure hassle free journey, clean & hygienic and full of comfort. We are just few click away. You can also book us for official purpose or to simply make your time worth it, hire full day taxi in Delhi. Our fleet of car is handled by our experienced drivers. Don’t wait for last minute cab booking. You might get stuck in traffic. Our Car rent is available on both the sides. Our rates cover Toll payments and parking charges. You don’t have to pay extra. Available for extended hours – up to 12 hours . We provide cabs on flat rate which is based on Duration of Time. Our charges are based on per kilometre drive with minimum kilometre drive every day. We also have a range of luxury cars with us like Audi, Mercedes, Honda City and many more. Our website is available with all convenient modes of booking. You can also book your car by calling us on the number provided. We also have a very convenient mode of payment that makes payment hassle free. Thus visit or give us a call to save 25% now.